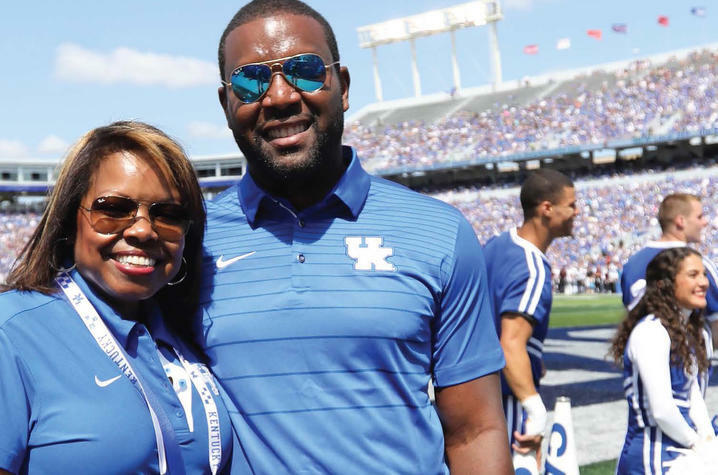 LEXINGTON, Ky. (Feb. 21, 2018) — Jomo Thompson ('00 College of Arts and Sciences, 2020 College of Business and Economics) and Dawn Walters ('88 College of Communication and Information) are both proud of their accomplishments as head coaches. But to do it at their alma mater means everything to the pair. Thompson won two national titles as a UK cheerleader and has coached the cheerleading team to 10 of its 22 Universal Cheerleaders Association titles. Walters, who was a member of UK’s first cheerleading title squad in 1986 (and won in 1987), has led the UK dance team to unprecedented heights, and it is now on the verge of its own national championship. Thompson, who cheered for two years at University of Florida before transferring to UK, is proud but also welcomes the challenge that comes with leading a program that is the best in the history of the sport. But his coaching tenure did not start out well. UK had won eight straight titles, but failed to win again his first year as coach. “The pressure the next year was even greater. I felt like I let everybody down, but we were able to win it back the next year and win it the next three years,” said Thompson, who had planned to get his master’s degree in business before coaching came calling. “I thought I would end up going into some kind of business, but the opportunity came along, and I took it. I’m glad I did. Walters came in with the task of building a program that would measure up to the cheer squad. She had her work cut out for her. The dance team had its best season last year, finishing runner-up in the Universal Dance Association Hip-Hop category and fourth in Pom. With success comes better exposure. Thompson, a UK assistant before taking over in 2002, said he is just trying to carry on the tradition that longtime advisor T. Lynn Williamson ('68 AS, '74 College of Law) built. Thompson also knows his squad serves as “ambassadors to the university,” so those are the kind of students he recruits. “A lot of people focus on competition, and that’s what we’re known for. But our primary focus is cheering at the games,” Thompson said. “That’s what a lot of the kids enjoy. It’s fun to have great seats for football, basketball, volleyball and gymnastics. While the two don’t think about it in the moment, they are also trailblazers as the first African-American coaches in their sports at UK. Thompson said UK had an African-American assistant coach when he was a student, so being a pioneer never occurred to him.